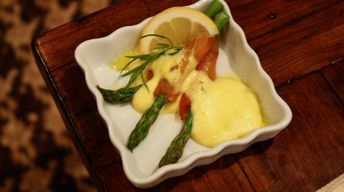 Wrap each asparagus spear with half of a slice of salmon and place on serving plate. Fill a medium pot with 2" of water; place on stove over high heat. Bring to a boil. Reduce heat to low and simmer. Whisk yolks together in medium bowl; whisk in remaining 5 ingredients. Place bowl atop pot of gently simmering water, making sure the water doesn't hit the bottom of the bowl. Continuously whisk egg mixture rapidly while over the gentle heat. When sauce is thickened and voluminous, check the seasoning and drizzle over the asparagus. Serve immediately. Bring to a boil in a saucepan, 3 cups water and 2 tsp salt. Put the asparagus in for about one minute, remove from the boiling water and place in ice water to cool. Drain well and set aside to cool.